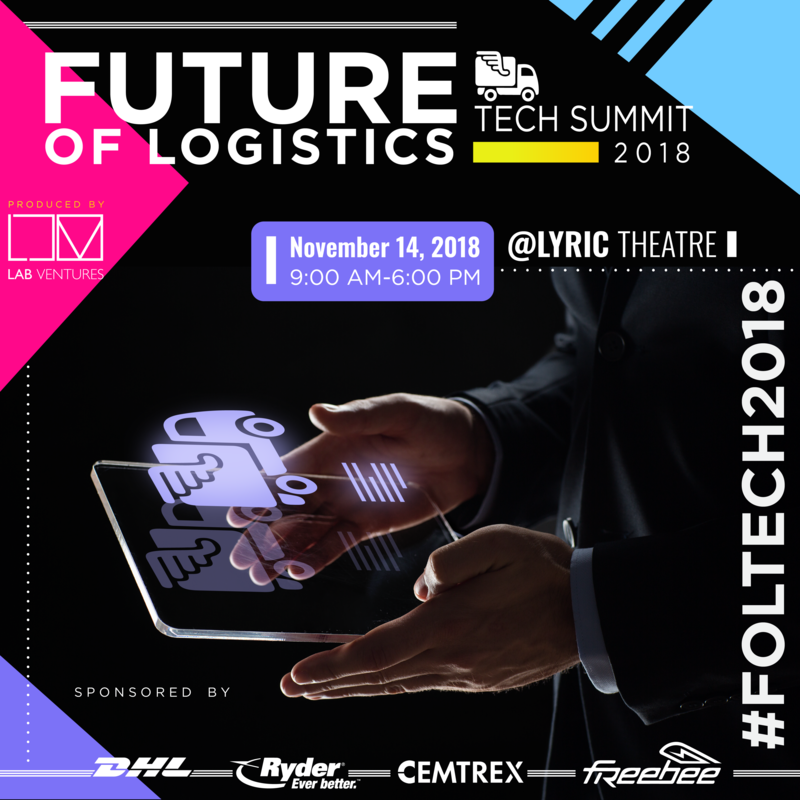 The Future of Logistics Tech Summit is the first event of its kind, focusing solely on technology and how it is causing rapid and unprecedented change in the logistics industry. 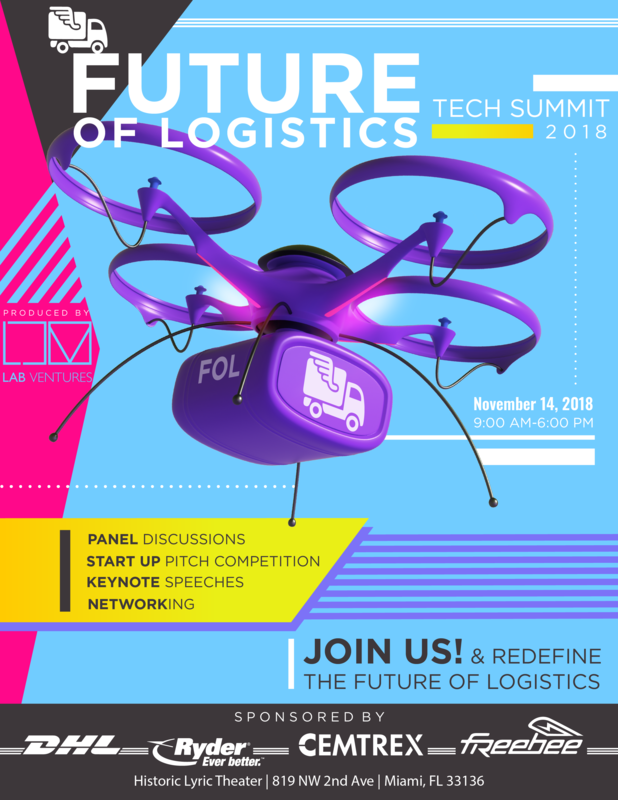 MIAMI, October 23, 2018	(Newswire.com) - LAB Miami Ventures is proud to announce the ten startups advancing as finalists for the Future of Logistics Tech Summit Pitch Competition on November 14, presented by goTRG. This is the first event of its kind, focusing solely on technology and how it is driving rapid and unprecedented change in the logistics industry while bridging the gap between industry leaders and some of the brightest and most innovative logistics startups in the region. ZigZag - helps retailers, carriers and 3PL’s manage returns globally (London, England). Kinetic - develops wearable devices to reduce workplace injuries for the industrial workforce (New York City, NY, US). Odyn - combines low-cost pallet tracking and AI-powered analytics to help manufacturers decrease working capital and increase synchronization in all levels of the supply chain (Somerville, MA, US). SimpliRoute - helps transportation and last mile companies to reduce their logistics costs up to 30% with a powerful route optimization engine and machine learning modules (Santiago, Chile). Shipit - the easiest way for an eCommerce to scale the logistics of their shipments with a comprehensive fulfillment solution (Santiago, Chile). ReturnRunners - on-demand return service for clothing and unused items (Chicago, IL, US). Nuve - revolutionizing how asset protection and monitoring is done in an Internet of Things world (Austin, TX, US). Octopi - web-based SaaS Terminal Operating System (TOS) made for small to medium cargo terminals to easily track their containers/cargo and manage operations (Miami, FL, US). SmartHop - autonomous agent for truckers to plan, search, and book loads (Miami, FL, US). AxleHire - the most innovative last-mile platform providing companies B2C shipping services with increased transparency and top service quality (San Francisco, CA, US). Not only will these startups get to pitch on the big stage for an opportunity to win almost $27,000 worth of prizes, but they will also participate in a full day visit to the corporate headquarters of the event’s sponsors DHL Express and Ryder System, Inc. Both DHL and Ryder have been recognized globally for implementing industry-leading practices and technologies in their operations. Now through their partnership with LAB Miami Ventures, are bringing innovation to South Florida by showing startups the value of working with local companies in the number one city in the nation for international freight. This full-day program at DHL and Ryder will give the startups an exclusive opportunity to meet senior executives from all corporate functions, including Innovation, Product, Operations, IT, Finance, Marketing and more. Meeting with all decision makers at once will give the top 10 startups a unique opportunity to accelerate potential commercial pilots. Join us and learn how technological advances are radically changing the industry landscape, and how you can stay ahead of the game. LAB Miami Ventures ideates new tech businesses and then develops them from scratch in partnership with highly motivated entrepreneurs. Our team provides marketing, finance, and product services and through our events, we bridge a gap that connects leading startups with established corporations and investors. Ryder is a FORTUNE 500® commercial fleet management, dedicated transportation, and supply chain solutions company. Ryder’s stock (NYSE: R) is a component of the Dow Jones Transportation Average and the S&P MidCap 400® index. Ryder has been named among FORTUNE ’s World’s Most Admired Companies and has been recognized for its industry-leading practices in third-party logistics, environmentally-friendly fleet and supply chain solutions, and world-class safety and security programs. The Company is a proud member of the American Red Cross Disaster Responder Program, supporting national and local disaster preparedness and response efforts. For more information, visit www.ryder.com. The hand-selected companies will pitch their innovative business ideas to industry insiders for a chance to accelerate their future. "I believe that in the near future we will see collaborations between many of the startups and corporates who participated in the event."